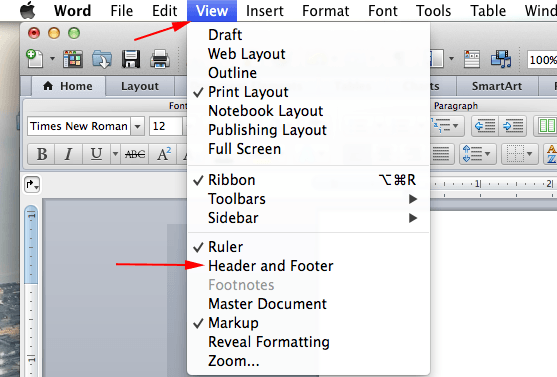 This tutorial will guide you through the process of setting up Microsoft Word 2011 on Mac OS X for your MLA Format essay. Click on the drop-down arrow on the right size of the font (as seen below) => scroll down until you find Times New Roman then click on it. Click on the font size drop-down arrow and click on 12. Click on the Layout tab. 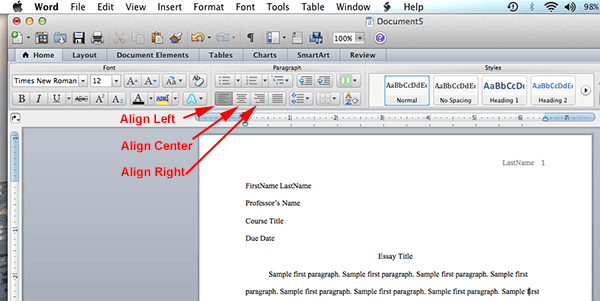 Under Margins, change the margin for all sizes top, right, bottom, & left to 1. 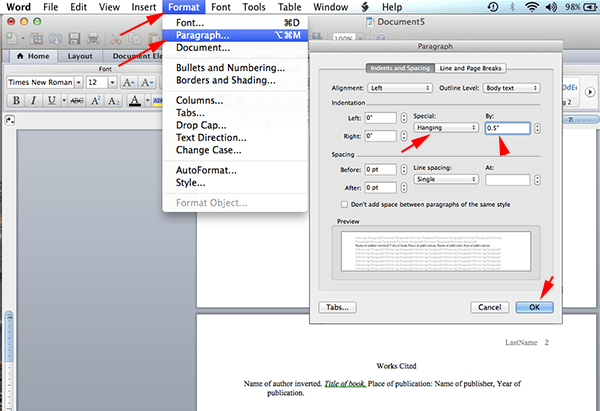 To create a header with your Last Name and automatic page numbering on the top of every page, follow these steps. Click on Header and Footer. Notice the Header is now opened with your cursor blinking on the left => click on the Align Text Right icon to bring the cursor to the right. Also notice the font is NOT Times New Roman => click on the font and set it to Times New Roman. Type your Last Name (no need to leave a space after your last name). Click on Insert => Page Numbers => click OK and done since the default settings (align right and show number on first page) are perfect. Click on the Line Spacing icon. Click on 2.0 and done. Immediately after typing the final line of your paper, click on Insert => Break => Page Break (to begin a new page). Your header with your last name and automatic page numbering should appear at the top right of your paper. The feature to setup indentation on the subsequent line/lines is called Hanging Indent. To setup hanging indent, click on Format => click on Paragraph => under Special, choose Hanging => the value on “By:” should now be automatically set at 0.5″ => click OK to finish. Now type your sources. If you have Internet sources, when you type in the URL, Microsoft Word automatically apply the hyperlink to it. You should remove the hyperlink by right-clicking on the URL => Hyperlink => Edit Hyperlink => Remove Hyperlink. This site was wonderful…I’m submitting my qualifying exam today and it’s always a panic to remember how to do the formatting. Thank you! This page helped me so much! So quick and easy! THANK YOU THANK YOU!! Make note that your page number in the header might not be in the proper font, either. You will have to highlight it in its box and select the desired font to correct the issue, similar to as you did with choosing a font for your last name in the header. Great way to do the paper and get the work done in the limited time given by the professor. Before i could take even two days trying to figure out how to put page numbers, header and footer notation and margins settings but with MLA i have become an expert. Thanks for generating this with us in mind. You are amazing!! plus easy to understand. Never heard of MLA before when I started school here in the States (just migrated here). This was super helpful 🙂 I get it now!! Thank you so so much! This saved a ton of time and research. Amazing tutorial! I can not tell you how many hours I have struggled on both of my Mac laptops, on both Pages and Word, to figure out how to get the page numbers to sort correctly with my name up in the header. FINALLY I found this page. Many, many thanks. For something so simple, it’s truly baffled me all night!